This is Hairy Larry inviting you to enjoy Something Blue every Saturday night at ten. This week we’re featuring Leonard Cohen, Bob Dylan, Tom Waits, and Richard Murray. For more about the show visit the Something Blue website at http://sbblues.com. Don’t miss Something Blue, Saturday night at 10:00 PM CST, at http://kasu.org. Welcome to Something Blue. I’m Hairy Larry and I’ve got the blues, for you. Amazing poetry from Leonard Cohen. We heard “You Want It Darker”, “It Seemed The Better Way”, and “Steer Your Way” from his “You Want It Darker” CD. Sandwiched in the middle there was Nobel Prize winner, Bob Dylan, singing the blues for you, one called “Cry A While”. Something Blue is broadcast on KASU, 91.9 FM and streaming on the internet at http://kasu.org. I’m Hairy Larry, host of Something Blue. 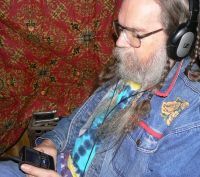 To listen anytime and to find clickable links to the music we’re hearing visit the Something Blue website, http://sbblues.com. Thanks to the Jonesboro Public Library where I legally downloaded many of the songs I’m playing tonight on the Freegal music service. No subscription required. All you need is a library card. Their website is http://libraryinjonesboro.org. Now here’s another blues poet, Tom Waits, singing “Hope I Don’t Fall In Love With You” and “Grapefruit Moon”. Now that’s what I’m talking about. Richard Murray singing “Better Times” and “Talk To Me” from our “Collaborators” CD. Before that Tom Waits sang “Old Shoes”. Richard Murray is a musician and a poet from right here in Jonesboro. I love recording local talent to play on Something Blue. I’m Hairy Larry, host of Something Blue. To find out more about what I’m doing visit my band websites, http://bebopbeatniks.com and hlmp.info. I also run the Delta Boogie website at http://deltaboogie.com. Blues and jazz poetry have been a part of American music for over a century. Whether it’s sung poetic lyrics or poems read over improvisation that rephrases the poets meaning in music it is the strength of the words that reaches the audience. Now here’s more Richard Murray lyrics in another original song, “Wouldn’t Have You Any Other Way”. Then closing the show we’ll hear Bob Dylan do “Mississippi” and “Sugar Baby”. This entry was posted in Shows and tagged Blues, Bob Dylan, Hairy Larry, Leonard Cohen, poetry, Richard Murray, Tom Waits. Bookmark the permalink.